So I am tired. I spent the day with few knitting time, but a lot of cleaning, throwing away, and running after kids. What can I say, living the mommy life. I have so many projects that I want to finish before Christmas gets here. Then I have another set of projects that I want to get done before 2018 meets us. Now Christmas shopping… Have you finished? Have you even started?? Well I haven’t! Crazy am I? I don’t know, but this year we’re planning to be different. Like everyone else, we usually overspend on all of these things that is definitely not needed at that time. I’m so grateful to have children that doesn’t give heartache on not having things right away. For the most part they are understanding and I hope and pray they remain that way as they grow. It took me all these years to finally see that…WAIT why am I spending so much on ONE (1) DAY???? With a list of reasoning (so I don’t feel crazy) I noted that we actually purchase things for ourselves and children throughout the year just because. No reasoning no nothing…just because gifts throughout the year. So all in all we are going to make purchases BUT it will be a significant change. No need to have 9,999,9876,332 gifts under the tree and hardly any space to put them…LOL. Hope this day was productive or relaxing for you!! It’s the 8th of December!!! Wwhhhaatttttt😮.. A week gone and Christmas gets closer. The New Year is approaching… Time is a ticking. Crazy! BUT sometimes we need to slllow down and take a break from all the adulting we do. My oldest and I spent some much needed chilled family time with a few rounds of the board game “Sorry”. This day was a more steady, don’t lose it kind of a day. Have you marked a day for relaxation or fun time? Everyone should have at least one. How was the day? I hope awesome as awesome can be! As you can tell I’m a little extra right now. During the after Thanksgiving sales and craziness, I made a purchased with knitcrate. Amazingly when I went to just browse there was an coupon that I couldn’t say no to. Now look what I have!!!! This is Novembers box and yes I’m thinking of keeping the subscription…We’ll see LOL. Today was a day and all the same. What made it worth while was getting these beauties!! SOOOO can’t wait to knit something with these.. just what?? Do you treat yourself to something for Christmas? Well just treat yourself at all? Today came and went. So busy with life in general and trying to be a successful smal business owner. With everything going and no time to say a really big WWWOOOOOSSAAHHHH, one good thing came out of it all. I finished the socks. NO I didn’t finish it over the weekend, BUT it is done. So puurrddyyyyyyyyy! Now will be shipped out to the rightful owner lol. Here’s to getting things done and trying to stay afloat of the madness!! Did you accomplish something that needed to be? Hope so! Hello there my fellow Royals!!!! What’s going on on this beautiful… Hot day (for me)? 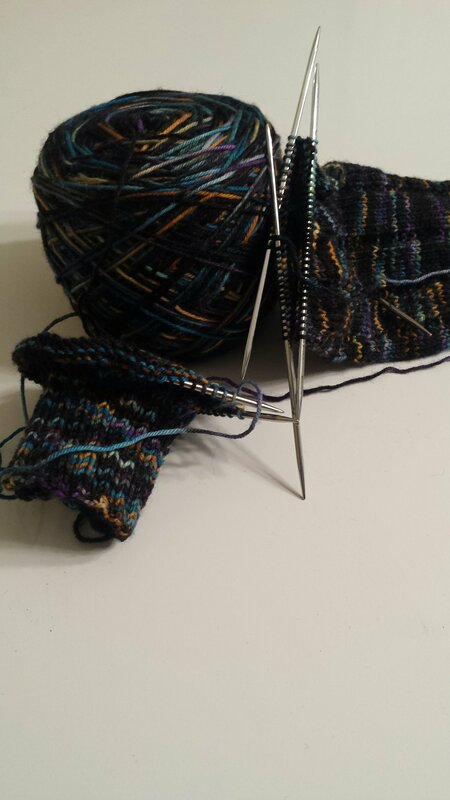 I’m taking the time and working on some other socks I started which I placed down to do other things. I figured I may give these as a Christmas gift once I have finished them…. If I don’t keep them LOL. From all the socks that I have knitted, I have not knitted any for myself…. Come to think of it everything I started for myself I have not finished. What’s up with that???? I can’t even start to explain why that is. I’m going to try to spend more time today on things that has not been finish and have everything else on hold. Let see if i can get any of them off the needles. Can’t gaurentee especially since mommy duties comes first and there is always something that needs to be done in the house…. Am I the only one that notices that? And once (if ever) you get all caught up you are too tired to even enjoy what you’ve been trying to do? Ugh mommylife i tell ya! Hope you grabbed this day by its horns and owned it!!!! ~M.o.R.~ Blogmas Day 2 Oooh Topper?? Here is another day come and gone… What’s was accomplished you asked. Nothing much…lol. . those socks I mentioned uggghhhmmmm..well I started new projects. OK OK I know I should finish one thing and move to the next but I figured these socks are almost off the needles so what the who.. Why not? Furthermore I realized a Santa I have isn’t what I use it for. 😂 Poor Santa suppose to sit on top of a tree and I use it to decorate a side table. Oh well it looks good there. How about you ready to finish everything to bring the New Year in with a clean slate? ~M.o.R.~ Blogmas Day 1 Christmas is coming! Hello my fellow Royals! How’s the weather treating you all? Well here in Florida…entering the last month of 2017… IT’S HOT!!! What happened to winter? Where is the cold front when you need it? LOL oh well. I figured since it’s what is done around this time… I would jump on the band wagon and record these days leading to Christmas. So i took the time, the day after Thanksgiving, and put up our Christmas tree with my three girls. Which I’m sure you can imagine was very interesting. With the oldest eight, the middle child two, and the youngest now tem months old… need I say more. All part of the joys of being a parent and feeling the warmth growing. Today i took the time to go through all the yarn I have and try to talk myself out of purchasing annnnyyyyymore.. Can you guess how thats going? The plus side is i have been working on another pair of socks that will be gifted to my cousin. I have already finished the first and now this is the second one. As long as I don’t cast anything new on I should be finished this weekend. How do you plan to spend your day? Any big plans for the last month of 2017? How’s everything? Any crafting lately? For me a lot! For some reason I have been feeling it’s necessary to knit and crochet EVERYTHING in sight. How do you get out of a curse of such…. 1- stop relying on people who have showed they have no such reliability. 2- stop telling ourselves “I’ll do it tomorrow” and sit and watch tomorrow never come. 3- stop not having faith in oneself. I have so many things slowly being added to my shop. I’m tired of not being 💯 with myself and what I know I am and who I could be. The reason for all my cast ons can be just that… I’m moving and not waiting on no one! I hope you Royals are awesome and getting things done! Stay positive and focused😘.